On May 28th 1970, I flew into Vienna on what happened to be an Austrian holiday. The next day I hitched my way out to the Czechoslovak border, crossed it and caught a train for Prague. To my surprise, aboard that train were three Americans that I had met in Athens two months earlier. I often ran into people in Europe whom I had met altogether elsewhere; but the fix was in on this rarity: in Athens, I had spoken to them fondly of Prague. As the train approached our destination, I intuitively sensed that staying with them would change things. They would have distracted me from friends and, less obviously, have recast me as not being a part of Prague. On arrival I ducked out and headed for Anna. It was dark when I arrived and she was a bit uneasy as she greeted me. Another tenant was renting my room or should I say his room, but it was late and her guest was away on a trip. Anna could not bear to turn me out into the night and changed the bedding. Exhausted, I laid down and fell asleep. The next day I found Jan who offered to rent me a room in his family’s apartment. That move was sped up by the unexpected return of Anna’s Arab tenant. She gave me my bag which had been carefully removed from his room, and I was on my way. Almost a year after leaving home, I found myself again with a family: Jan’s mother, grandmother, cousin (Helenca) and, of course, Jan himself. Shortly I discovered the Institute of Mathematics and from time to time visited its library. One day while reading, I noticed the room filling with “Filipinos.” A bit further on, I began wondering how Filipinos would come upon this side of the Iron Curtain. Raising my head slowly, their numbers had increased and I realized that I was surrounded by the enemy: youths from Communist portions of Vietnam. By then I knew the librarian well, and walked through a door to receive her confirmation. She had wondered about telling me, but felt no real need. I presume that meant that she deemed them safe and, considering the numbers, didn’t need to worry about me. While in Prague, I never thought of myself as fraternizing with the enemy; but surely I was sneaking a peek between the lines of the latest pages of Das Kapital. Jan knew in detail about Animal Farm, not I. Months earlier, upon mentioning being from Massachusetts, my cohorts got all excited about some rock group. They knew of the Bee Gees, not I. Perhaps there had been that meager fraternization over a drink in Sophia, Bulgaria but for me, then and now in this library, it would have been absurd to relate to these young men surrounding me in any way other than as I did. Still, looking back forty years, I was about to fraternize. Remembering the formal peace negotiations that had gotten hung up over a petty gambit about the shape of a table, I approached with the thought “no way” on my mind, and held out my hand. It was joined, but there wasn’t much we could say. Regarding them as from former Indochine, I tried French, and was surprised that it didn’t fly. I went over to a table with a piece of paper and drew a map of the United States (continental only), outlining Massachusetts. I pointed to myself and to my state; they understood. The one who had accepted my hand pointed to me and uttered “SDS?” I had never joined Students for a Democratic Society and shook my head a no, then I took another piece of paper, drew a map (horribly crude in retrospect) of Vietnam, partitioned it, pointed to him, then to the North, and to the South. The last thing I remember of the encounter was his indicating the North. I had missed the opportunity to be certain that no Vietcong teen had been among them by pointing to the South, while panning the group with my other hand. With no special plan, I had left out the ice and now wonder how well they did back home as compared to those fed but frightening lies. Then . . . came the real terror. In a few days, the librarian approached me with an invitation to present a paper before the faculty. I must have hesitated because I recollect her mentioning how nice it was that this way of thanking the Institute had come along. I accepted and began preparing with a patriotic eye towards something that couldn’t possibly be useful. How foolish of me, had I been able to tell apart the useful from the useless of abstract mathematics, I would more likely have been back in Madison, Wisconsin than there in Prague. My choice had beauty and meaning to me, but being overly reined in, it ended up projecting neither. The day arrived, and after I had presented, a woman came forward and what she accomplished was remarkable. Not only did she speak with some command of English, but when I had first heard her topic in Madison, I had known it to be important. Now here she was giving me a second chance at understanding it. To me her words were about orderings and origins: original cause and now, as I write, original intent. I could not walk backwards through these memories if I had no grasp of my place in them: that is of my original intent. As a corollary of that paper, I can only grasp such intent when I disqualify as reference all that I would come to learn afterward which bear upon the actions of that moment. I got a bit further into the topic but, transfixed by her and the event itself, something slipped by, and in Mathematics that is how it ends. Everything wrapped up with refreshments and light conversation. I left and headed back to Jan’s. While roaming the streets of Prague, my walks would sometimes take me across the Vltava River and up to Prague Castle, Hradĉany. While there one day, I entered a room with many glass enclosed, bejeweled goblets (monstrances), and after marveling over the devotion that made them, I went outside and re-entered a different room with old and beautiful crafts. As I exited, something struck me as odd: there was no one attending the collection. Later I mentioned this to Jan, and was left with a sense that the art was guarded by both honor and fear. One never really knew when one was being watched, nor could one become well off without being noticed, even by those not watching. Jan often took me places himself. One day while walking pass a church, it quickly became the focal point of an historical account of the death of a German terrorist, vintage World War II, Reinhard Heydrich. His assassins completed their lives in sacrifice within that church’s walls. I cannot remember what knowledge I had brought to that lesson but I left with more. One day I would add to it (and do suggest) The Murder of Lidice by Edna St. Vincent Millay. 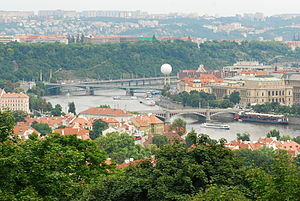 On another occasion, we had walked down to the Vltava River by one of its bridges, the Charles. Jan pointed at an abutment and told me that in construction (six centuries ago) a secret ingredient had been introduced to strengthen the bridge’s mortar: eggs, millions of eggs. He was quite adamant but apparently doubts had reduced the account to legend. Years later the binder was confirmed by DNA testing to be scrambled mortar. For me, his grandest tour was of the Žižkov district of Prague. We walked to the enormous statue of a Czech hero, the district’s namesake. From there we went to the New Jewish Cemetery where, among others were buried the remains of Franz Kafka. It was Sunday, and there I was pounding on the gate in protest of my denied entry. It was locked on that of all days. Finally a voice way inside yelled out, “It’s Sunday!” Well, I knew that, but whose sabbath was it anyways. In time, I realized that, despite my indignation, Kafka wouldn’t have given damn . From there we walked uphill towards grave sites in the adjacent Olšany Cemetery. Off to the edge of the grounds was what from a distance appeared to be a small flower garden. As Jan and I drew near it transformed into an array (about 250 square feet) of floral remembrances bedecking the grave of Jan Palach; and by that, I was drawn further into this blackboard for a lesson of sadness emerging from the abrupt termination of Prague Spring. Standing there, I did not know that a stream of such flowers (etc.) had kept their vigil for 16 months. Leaving the spot, we entered a wooded area and came to a place where some magnificent baroque statues had taken refuge from the maddening crowd. Jan took their presence as quite normal: some statues prefer to place themselves upon pedestals in public; these preferred seclusion, but apparently not from each other. We headed back to Parizska street and Jan’s family. As my stay in Prague drew to an end, Jan arranged for the two of us to join Milada at a train station and head out to her family cottage on the outskirts of Prague. Before departure she “spoke” to Jan: being mildly miffed is really just about the same in Czech as in English. Then they joined me as to board, but Jan wasn’t coming. Sensing that he felt out of place, I reassured him. Milada was aboard, but when did I, to all that had just happened. Her family cottage overlooked a fielded valley, and although I remember no long walk out to it, I felt ourselves to be far enough from any reference points as to be anywhere. There was a target on the overlook and a BB gun. She had me try it. On one shot, an instant into pulling the trigger, I noticed a small group walking through the tall grass of the valley below and into my line of sight just beyond the target. The shot was off and I leaped up to the edge with my heart pumping, and looked down in dread. For me it is unnerving to set a course and an instant into it bring the thing to a stop, yet sometimes that needs to be done. Nothing had really happened and whatever we spoke of is lost to these four decades: hardly that is except for a comment on the train back. She asked me to keep a secret; she had a friend and hadn’t gotten around to telling the others about him. I agreed, but may have actually broken my word. Shortly afterward Jan asked what I was thinking of and I blurted out that I had been wondering if Milada had a friend. When he followed up on it, I lied that nothing had been said and until now nothing would be said. My rampant imagination has always taken him as having been a high government official from Russia. Then he said “Hradĉany” and pointed to the pedestrian walkway. 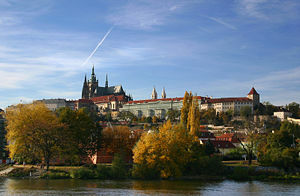 A few hundred yards back, Prague Castle had peeked at me from between the buildings; I knew where it was. A double duty to my native and host countries suggested the cul-de-sac while simple courtesy, the castle. A choice, quickened to be seamless, let me warn him against the walkway and head him towards Hradĉany. In a few days all of us were at one of Prague’s great beer halls. Besides Milada, there were surely other women there but I cannot recall. I only remember her and how intent she was towards whoever was with her. Clearly her friendship towards me had been enough but not the enough of my imagination. While I was deeply engaged in conversation, she caught my attention with “Je vais (I’m going).” I nodded and was back in. A moment later I realized that I might not get to see her again, grabbed Jan and asked where she had gone. She was ill and had headed home. I could not let that be a last good-bye before boarding a train for Spain, and left the hall walking briskly along Prague’s cobblestones towards her apartment building. Inside was a foyer with mailboxes. Either I could not find the family name or no one answered, for that pleasant smile and my nod back were to be it for us. Reader, if there is a Chapter 5, it will take some time. Thank you for your interest. This entry was posted in In Search of Lost Memories and tagged communism, Prague. Bookmark the permalink. Hi my friend! I want to say that this article is amazing, nice written and include almost all important infos. I’d like to see more posts like this.